The basal angiosperms (broadly construed) are the groups that diverged from the rest of the flowering plants (angiosperms) relatively early in their evolution. 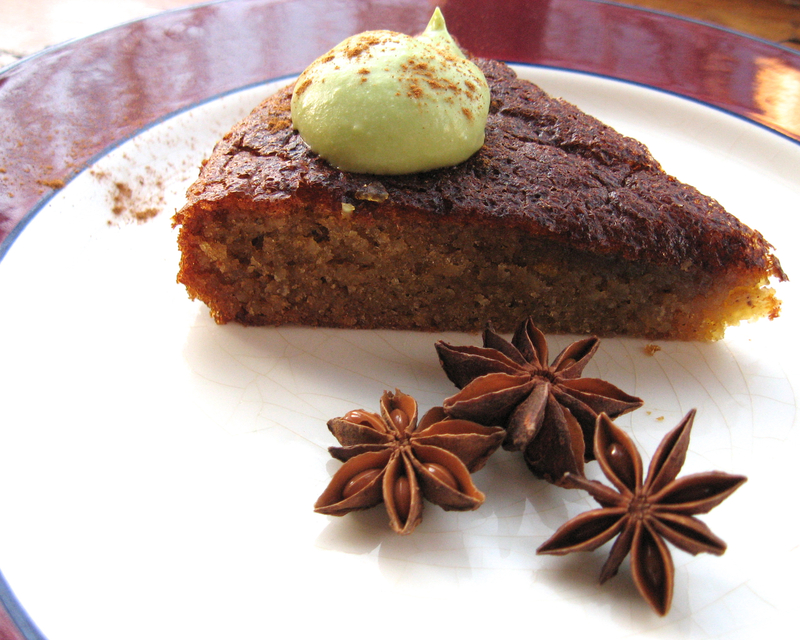 They give us the highly aromatic spices that inspired my cake – star anise, black pepper, bay leaf, cinnamon, and nutmeg. They also include water lilies and some familiar tree species – magnolias, tulip tree (Liriodendron), bay laurels, avocado, pawpaw (Asimina), and sassafras. It would be a mistake to call these basal groups “primitive,” since they have been evolving ever since their divergence. When a lineage branches off of the trunk of the main tree, it’s not like it is getting off a train and standing still while everyone else keeps moving through evolutionary space. “Basal” or “early-diverging” are much more accurate terms. Still, members of these groups have some features that we think were present in the first flowering plants, and we could call those features primitive – or more accurately, ancestral or plesiomorphic: most are woody, with simple leaves and simple unfused floral parts that are often neither sepal nor petal (so are called tepals). Think bay leaves and magnolia flowers. Some basal species make special cells packed with flavorful ethereal oils. These were not present in the very first flowering plants but apparently evolved fairly early, maybe 150 million years ago. Again, think bay leaves, sassafras, and star anise. The basal groups are sometimes awkwardly called the “nonmonocot noneudicot angiosperms” because they do not belong to either of the two very large main branches of flowering plants: the monocots (e.g. grasses, orchids, lilies, palms) or the “true” dicots (eudicots, e.g. grapes, beans, roses, broccoli, tomatoes, sunflowers). We more often use a much more charming label: ANITA and the Magnoliids. ANITA is an acronym of orders and families within the three lowermost branches of the angiosperm tree. 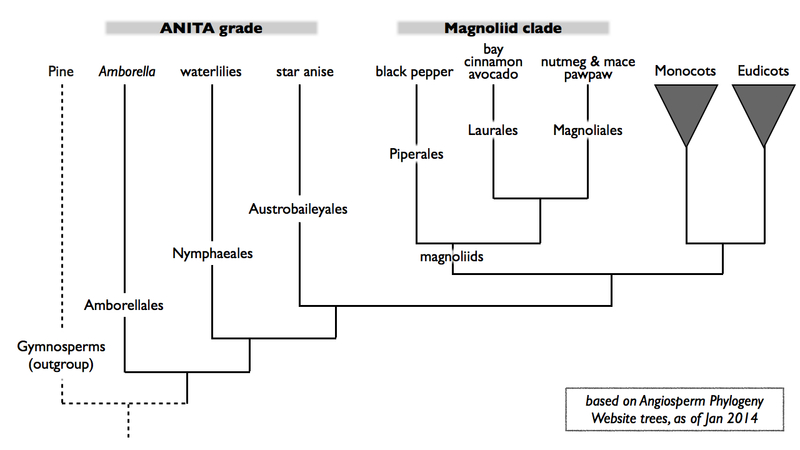 Taken together, these groups do not form a single discrete branch, or clade; instead, they represent three different clades arising from the main tree and are collectively called a “grade.” (Now that the families represented by I, T, and A have been grouped within the order Austrobaileyales, we sometimes collapse the acronym to ANA.) 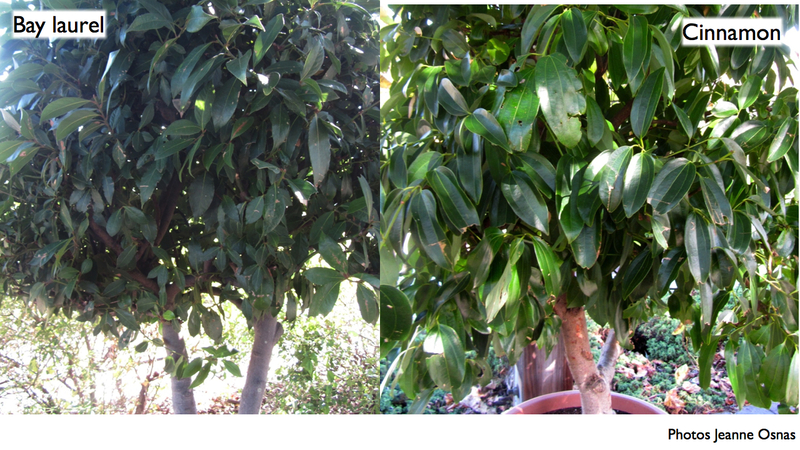 A fourth branch, the Magnolia group, is larger and younger and is sometimes treated separately from the more basal groups. We include it here because it shares important features with the ANITA grade. And if we didn’t allow the spices from the magnoliids, star anise would be the only truly basal ingredient. Spices from the basal groups taste good together and I have been experimenting with them ever since that first cake. My new recipe is almost completely phylogenetically pure and really captures some of the essential flavors of the grade. I love that the spices come from different plant parts and are beautiful up close. A cinnamon stick is a dusty roll of inner bark, and bay is a smooth simple leaf. Black peppercorns are entire fruits, nutmeg is a seed with a convoluted interior, and star anise has flavorful fruit walls. To minimize monocots and eudicots in the recipe, I replaced cane sugar with honey. The honey undoubtedly contains nectar collected from many flowering plant species, but I’m willing to live with this one imperfection. If you can raise a hive on only California bay, let me know. Seriously. In place of wheat flour, another monocot, I folded in an outgroup: pine nuts. Pines represent the gymnosperms, the closest living relatives to the flowering plants. In systematics, the ancestral state of a character is judged by looking at an outgroup, a taxonomic relative just outside of the tree of interest. Just as the outgroup anchors the base of the tree, the matrix of ground pine nuts anchors this cake. There’s no gluten in it, and the resinous flavor of the pine resonates with the aromatic basal spices. Before talking about the basal ingredients, I’ll take a short detour to mention Amborella, the most famous species you’ll never see. 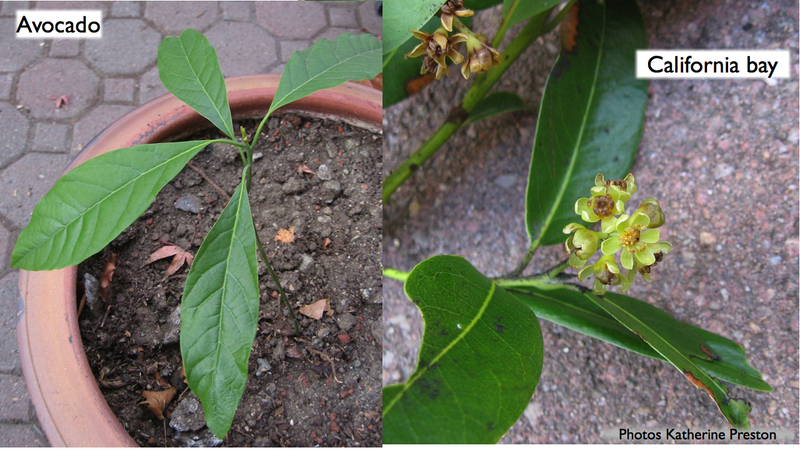 In the years since I made that first cake, evidence has been mounting that the most basal branch on the whole angiosperm tree is represented by a single surviving species, Amborella trichopoda, a small-flowered shrub endemic to the South Pacific islands of New Caledonia. It exists naturally in only a dozen or so populations on isolated slopes in the wet tropical forest of the main island, Grande-Terre. We don’t eat it, but it’s worth noting here because it starred in one of the biggest botanical stories of the year. In late December 2013 its genome sequence (actually both its nuclear and mitochondrial sequences) was published in Science Magazine (summaries here and here). What the authors report about the sequence and its functional structure tells us a lot about plant evolution in general, and it opens the door for many more extremely important discoveries. No wonder #amborella dominated my Twitter feed for a few weeks. 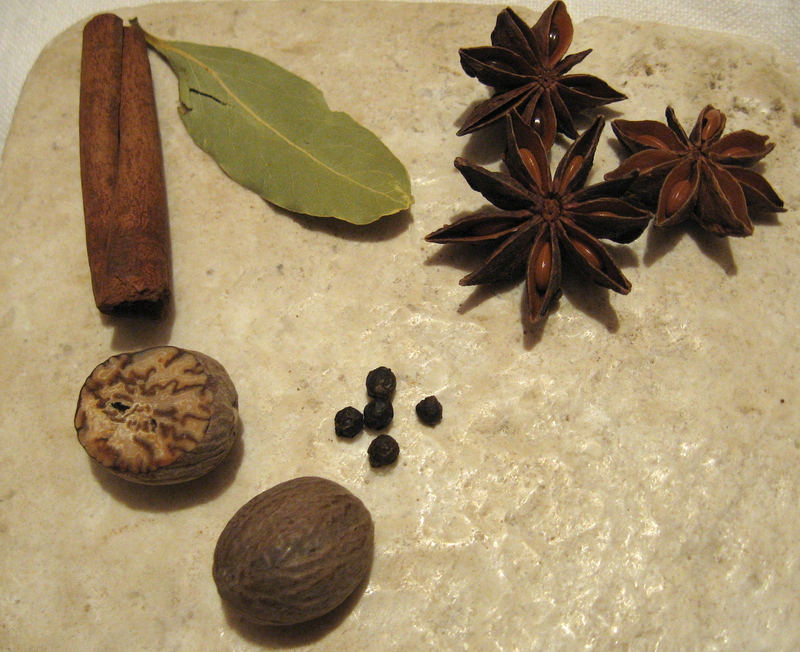 Star anise belongs to the family Illiciaceae – the “I” in the ANITA grade – in the order Austrobaileyales. 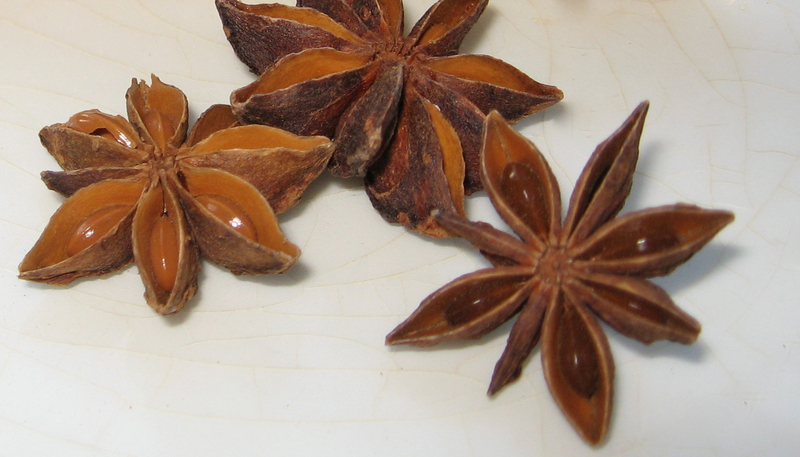 Whole star anise is the tough woody fruit of a simple flower. The flower makes six or more carpels that become the fin-shaped points of the star. Each contains a single seed, which is usually still in place when we buy them. In nature, seeds explode out of the fruits, propelled by the drying of unevenly thickened cell walls within the carpels (Romanov et al. 2013). The seeds are extremely smooth and shiny, which aids their ballistichoric launch into space. The genus Illicium is distributed broadly across the moist tropics and subtropics, and I. verum comes from southeast Asia. To use the spice, grind it, grate the fruit walls on a microplane, or cook the whole fruits with the dish and remove them before serving. Bay, cinnamon, and avocado all belong in the Laurel family (Lauraceae), along with sassafras and camphor. 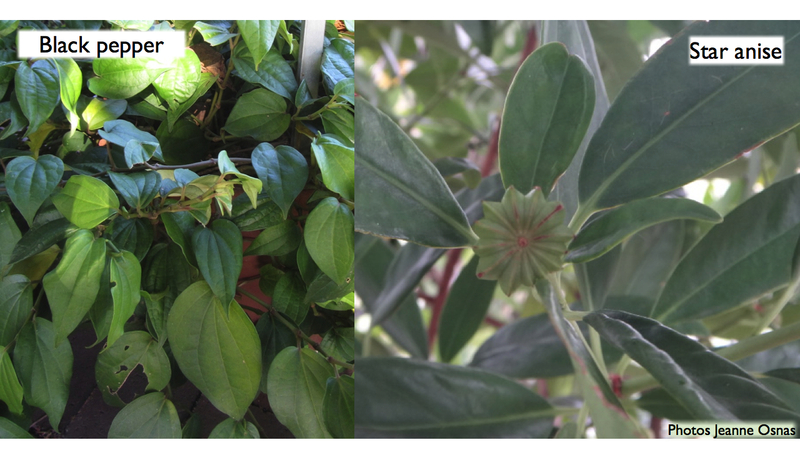 Laurus nobilis is the Mediterranean plant we know as bay leaf. The simple shape and smooth edges of bay leaves illustrate some of the leaf characteristics common within the Magnolia group. California bay (Umbellularia) is closely related, but has a different and very strong flavor. It can also be used in the kitchen, but very sparingly. Just the smell of its leaf litter in the woods can give me a headache, and a recent study showed that its volatile oils repel mosquitoes (Tabanka et al., 2013). Bay leaves are superficially simple and ubiquitous – and we toss them into stews with hardly a thought – yet their scent is complex, with a hint of genuine antiquity. Bay trees can be found growing among the ruins of the Forum in Rome. For centuries, wreaths of Laurus nobilis have crowned victors, graduates, and poets. Apollo wore a laurel wreath, and when Daphne couldn’t outrun him, she had no choice but to turn herself into a laurel tree. Even now we seek refuge in the scent of bay leaves wafting from a huge pot of vegetable bean soup in a warm kitchen. Antique stores filled with old wood and furniture polish actually smell a bit like bay. “True” cinnamon is derived from the inner bark of a tree native to Sri Lanka, where the vast majority of the species is still grown. Other species (especially C. cassia) are grown elsewhere, also for export as cinnamon. (Cassia cinnamon was at the center of the second biggest Basal Angiosperm story this year). In addition to ethereal oils such as cineole, cinnamon contains the strongly flavored cinnamaldehyde. Grating a fresh nutmeg seed reveals beautiful dark lines running through it like veins in cream colored marble. Those veins are places where the seed coat has folded in and been caught by the endosperm (the storage tissue of the seed). It is common in this part of the phylogenetic tree for the endosperm to be ruminate, meaning that its surface is covered in deep folds, like the villi lining an intestine. The seed coat falls between those folds. A striking closeup can be seen here. 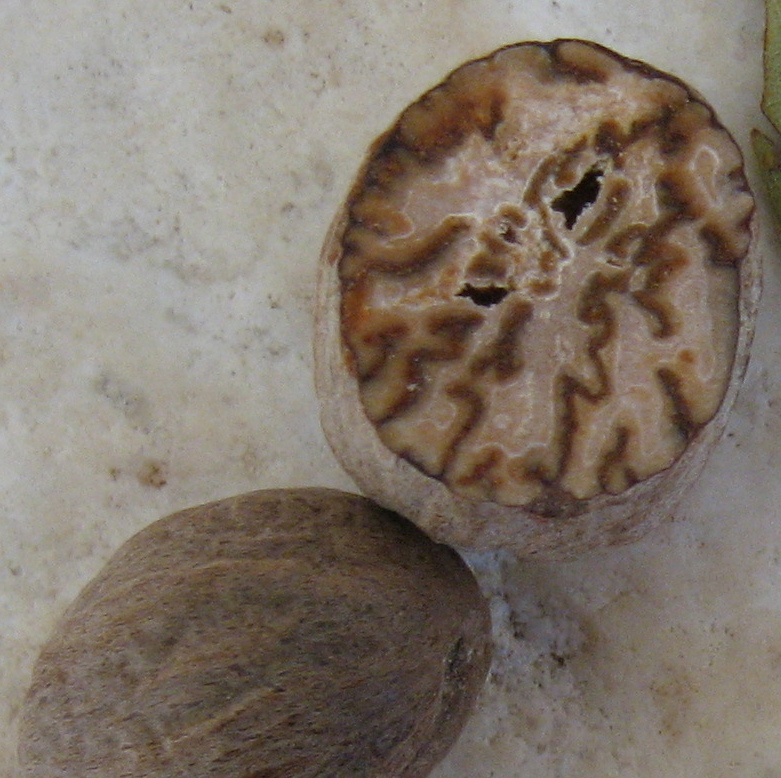 A nutmeg seed develops as the only seed within a dense fleshy fruit. At harvest, the seed is covered by a bright red aril, an outgrowth of the funicle which attaches the seed to the inside of the fruit. The aril is removed, dried, and ground to become the spice we call mace. Myristica fragrans is native to Indonesia where it grows in wet lowland forests, and it is also cultivated in southern India. Star anise and the magnoliid spices owe some of their strong and complex flavors to abundant ethereal oils held in specialized spherical cells in their leaves and some other tissues. Specifically, these are volatile mono- or sequiterpenoids that generally have a resinous, citrusy, peppery, or camphor scent. Their flavors and pungency are also influenced – sometimes dominated – by other types of compounds, such as phenylpropenes and alkaloids. Ethereal oils seem to be broadly effective at repelling insects and retarding fungal and bacterial growth. All of the spice-bearing species described here, except bay, live in warm wet forest understories, where defense against predators and pathogens would be extremely useful, so it’s reasonable to suppose that ethereal oils play a defensive role. There’s nothing ethereally dainty about either the flavor or function of ethereal oils. Evolutionarily, ethereal oil cells disappear somewhere along the branch leading to the eudicots, only to show up again in scattered families: myrtle (allspice, clove, eucalyptus), citrus, mint, carrot (caraway), and sunflower (tarragon) families, for example. Some of the monocots either retained or regained ethereal oils, notably ginger and cardamom from the ginger family. Extracted ethereal oils also show up in mouthwash and shampoo. The botanist in the shower can douse herself with cineole, limonene, menthol and thymol, among other more floral scented terpenoids. For now, though, we’ll stay in the kitchen and take advantage of the spices we can collect from the lowest flowering branches. Preheat the oven to 350º F. Line the bottom of a 9” springform pan with parchment and butter its sides. With a mortar and pestle, grind a teaspoon of salt into the bay leaves to extract their fragrant oils. If you are using whole star anise, add the half fin and grind lightly. A little star anise goes a long way. The salt will be reduced to powder. Sift the salt through a very fine sieve or microplane grater and measure out 0.5 t to use here. Beat the yolks lightly to loosen them and add to them the honey, soda, salt, and spices. Stir in the ground pine nuts. Beat the whites until they are very foamy but not quite forming soft peaks. Stir them into the rest of the batter. Bake the batter in the pan for 40 minutes. If the center does not seem set, cook for another five minutes. Allow to cool for 10 minutes and remove the sides of the pan. Heat a cup of whipping cream to just below simmer. Turn off the heat and add a whole star anise, a cinnamon stick, a heaping teaspoon of black peppercorns, half a bay leaf, and a good grind of nutmeg. Steep until the cream cools to room temperature and strain it. Gershenzon, J., and N. Dudareva (2007) The function of terpene natural products in the natural world Nat. Chem. Biol. 3:408–414. Liu et al. (2013) Studies on the chemical and flavor qualities of white pepper (Piper nigrum L.) derived from five new genotypes. Eur. Food Res. Tech. 237: 245-251. Massoni, J., F. Forest, and H. Sauquet (2014) Increased sampling of both genes and taxa improves resolution of phylogenetic relationships within Magnoliidae, a large and early-diverging clade of angiosperms, Molecular Phylogenetics and Evolution 70:84-93 . Tabanca et al. (2013) Comparative Investigation of Umbellularia californica and Laurus nobilis Leaf Essential Oils and Identification of Constituents Active against Aedes aegypti. Jour. Agr. Food Chem. 61: 12283-12291. This entry was posted in Flavor, Recipes, The basics, Uncategorized and tagged angiosperm, evolution, flavor, gluten free, pepper, phylogeny, recipe, spices. Bookmark the permalink. Wow! Who knew?!?! Beautifully illustrated–loved the link to the microscopic image of the nutmeg. Now . . . when can we get a piece of the cake?! 🙂 From a non-botanist, non-cook . . . Cool article and glad you pointed out that they aren’t necessarily “primitive” plants but saying “basal” or “early diverging” still implies that, so using those terms isn’t seen as correct either. Thanks for these links, Nic. They are a good reminder of how our diagrammatic representations and vocabulary reinforce some misconceptions. I admittedly played a bit loose with the “basal” language myself. For good or bad, botanists routinely use the term to talk specifically about these clades, so I’m on familiar ground using the vocabulary of the field in that context. When used more generally, though, we (I) probably should try to be clearer about the relationships described. (For those who can’t get to the papers, one of the main points is this: the tree splits into two branches at each branch point and we call the “smaller one” with fewer species “basal,” although it’s no more “basal” than the larger one. In our case, the larger one contains the magnoliids, monocots, and eudicots. )The cost of being precise is awkward construction: “the sister lineage to all other X.” Still, thank you for bringing this line of debate to the blog and providing good references.